Stay organized and focused. Spend your time perfecting your spell work by using the Book of Shadows Template. Our e-book in PDF format gives you a starting point to begin your own Book of Shadows. The Book of Shadows is chocked full of recipes, herbal lore and natural beauty tips for earth-loving witches. We have included blank template pages for your spells, recipes and herbal lore. Ghost Come to Me and so much more……. Please note this E-Book is in Adobe PDF format and cannot be manipulated via the computer. All templates must be printed. The colored templates print well on white paper while our black and white images are perfect for varied parchment. The above quote is from Shakespeare’s play, Hamlet. It is Polonius' last piece of advice to Laertes, his son, before the youth goes away to study in France. It’s the perfect quote to open this book. Constructing your Book of Shadows is a journey where you’ll need your creativity and your own experience with Witchcraft to dictate how your copy is constructed; be creative, follow your heart, and grow as a witch. 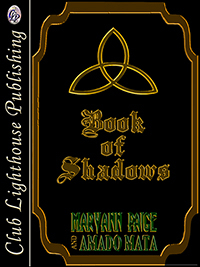 The Book of Shadows acts as a tool to offer the witch ideas for the collection of spells, magic, rituals and much more. A great deal has been said by the Wiccan communities as to the creativity and the personalization that a Book of Shadows should contain; this includes handwriting inside the book. While I practice my craft alone, I agree with their consensus. By handwriting your spells, rituals and magic into your book, it will not only transfer your energy into the book, but will help you memorize your own procedures. I do offer one word of advice for the pen users: Please watch your handwriting. I'll never be able to tell you the countless times I was unable to read my own scribbles and had to rely on memory to dictate certain spells. This is especially tricky when dealing with potions. Keep it legible. I hope you enjoy putting your Book of Shadows together, and please remember, DO NOT become consumed with anyone's dogma. Many covens and solitary witches have similar, yet different beliefs. Find your own magical voice through research and scholarship. The reason you decided to become a witch is to learn more of your craft, work hard to perfect it, to become a better person, and to create a better world around yourself. This includes finding your own peaceful grounds in which to practice. I'm sure you have your reasons for practicing alone as I do. There are certain aspects of my personal likes and dislikes that I enjoy incorporating into my spells and rituals. That preference makes them no less potent than others made by following the ancient traditions to the letter. Witchcraft is much more than simply following rules. It's a state of mind and personal power. It's about feeling whole and channeling your personal energy to make life better for yourself and for others.